I recorded some Erroll Flynn movies off of AMC last week (Captain Blood, The Sea Hawk, The Adventures of Don Juan) and decided to look up what other films Flynn did. I was surprised to find that he did a western called "San Antonio." It was apparently a pulp western (1945) probably filmed on a studio backlot and had little to do with actual San Antonio. 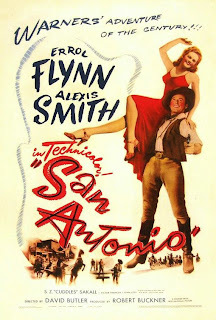 Still, I thought it was neat that there was a film called San Antonio that I had never heard of before. Looking at state-by-state poll results, Chris Bowers at Open Left crunches the numbers and determines that even in the worst case scenario, the “weakest” Democrat, Hillary Clinton, would crush the “strongest” Republican, Rudy Guiliani in the electoral college by 335 to 203. And I hardly believe that Connecticut or Ohio are going to go Red next year. The surge is working! That’s the latest hue and cry coming from the warbloggers who are constantly looking at their tea leaves for any signs of “progress” in Iraq. The increased troop levels on the ground in Baghdad have helped to tighten security and have reduced the number of insurgent attacks and corresponding deaths among the civilian population. Sure the surge is “working” in that respect. But that is NOT why we had the surge in the first place. The stated purpose of the surge was not to just heighten security and reduce violence, it was to provide breathing space for the Iraqi government to work out a political solution that would end the Civil War and provide a stable situation so that the U.S. can finally leave. And unfortunately, that is not happening. Without the political progress that it was meant to foster, the surge is pointless. Its effect will be temporary and as soon as we end the surge the insurgents will rush back in to fill the void and the fighting will continue. We will have accomplished NOTHING. So NO, in the only area that really matters, the surge is NOT working. House Republicans are flat broke, and there's no sign of better cash days in the near term. Less than 15 months from Election Day, the House Republican campaign arm -- the National Republican Congressional Committee -- continues to effectively run a negative balance. The committee has just $1.97 million in its accounts, as of July 31, according to FEC reports it filed this week. But the NRCC is also sitting on a debt of $4.1 million. On the other side of the aisle, the Democratic Congressional Campaign Committee is awash in cash. It has $21.3 million in its accounts, for a better than 10 to 1 cash edge over the NRCC, and it has out-raised its GOP counterpart through July. The DCCC raised more than $40.5 million so far this year. The Democratic committee has $3.5 million in leftover debt from 2006, which was down from $9.3 million at the end of last year. What's worse for Republicans, the FEC just issued a report on fund-raising by individual candidates for the House and Senate, and the vast majority of the money is flowing to Democrats: House Democratic candidates raised $94.2 million through June 30, while House GOP candidates took in just $63.6 million.